Reduce your guilt, stress and overwhelm. Live a calmer, happier and fulfilling life. Are you feeling overwhelmed and exhausted by your many responsibilities? Trying desperately to find a blend between work, kids, partner, family, friends and have some ‘me time’? Are you dealing with chaotic mornings, a stressful job, and then rushing home to make dinner and shuttle kids to activities – having to remind yourself to breathe? Finding yourself yelling and being angry when you don't want to be? Feeling guilty because it’s not working for you? Wondering, is this all there is to life? Unhealthy Stress Results in Coping with Wine and Netflix – zoning out with wine and Netflix (or Facebook or Instagram) becomes a common way to numb the exhaustion and emotional aches for something more. I just can’t deal. Overwhelm Creates Procrastination Nation – the laundry, dishes, dust bunnies, continue to pile up while the anxiety of tackling them hangs thicker over your head. Even booking kids dental appointments, creating a will or getting around to doing hobbies are pushed off because of lack of time and motivation. The to-do list gets longer and overwhelm is paralysing. Living in the “Is this all there is to life?” Zone – feeling sad deep in the heart that there isn’t more to life than the repetitive daily tasks of cooking/ laundry/ driving. Staying in the boring dead-end job that pays the bills but doesn't fill your spirit. Or running a business that struggles to earn income while juggling the kids. What happened to your ideas or dreams? It feels unreachable. In fact, finding happiness daily that lights you up from the inside-out is rare. Yeah, that’s the zone. Is this hitting home? It's common, but it doesn't have to be this way. You don't need to "just survive." You can thrive! Calm and Happiness – I will help you do the things that nurture YOU so that you can feel fulfilled and be happier. Imagine sipping coffee in peace, reading, exercising, hanging out with friends, learning, volunteering or even having time to think. Bliss. We'll work together to figure out what lights you up and get you there. When you're happier, your family is happier. Stronger Relationships with Kids and Spouse – I will support you to have more fun, quality time with the people you love. You’ll be present, patient, calm and helping things to run smoother with less energy. The result is happier kids, a deeper connection with your spouse, and less stress for you. Life with Meaning – Living a meaningful life may also include work, owning a business, volunteering, learning and other aspects in your heart. You are a whole, beautiful woman and so we work from that holistic perspective focusing the blend of your life. Your personalized coaching sessions will give you clarity on what you want, create plans and actually do it – all with a family. Are you ready to make changes so you can live the life you want? Do you want proven coaching support to get there easier and faster, than doing it on your own? If the answer is yes, send me a quick email to book a time to chat about what you want and I'll answer all your questions about coaching. * There are no obligations. It's very important to me that we both are a "hell yes" before ever talking about working together. ** Do it now before the kids distract you. LOL. 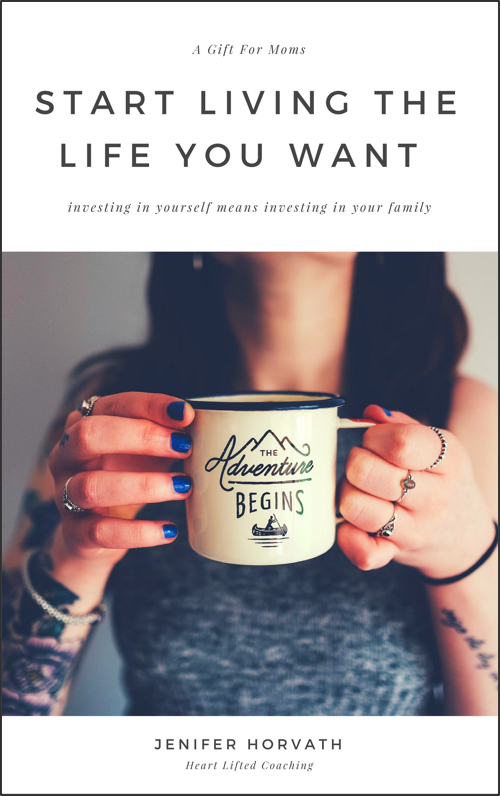 * Get this workbook and other success tips to help you start living the life you want.